If it’s made with whole grain, is low in sugar, includes an entire cup of healthy fat, has 4 eggs, and one of its main ingredients is a vegetable – you can use the words “cake” and “breakfast” in the same title. Of course, nothing is stopping you from using the word “birthday” and “cake” in the same title for this very recipe. After all, who says birthday treats have to be loaded with sugar? I just love that this recipe is healthy and filling enough to be a great breakfast option. I serve this with a side of applesauce and my family loves it! You might look at this recipe and think that it is surprisingly similar to my Pumpkin Chocolate Chip Muffins recipe. That’s because it is. ;) I took the recipe, and made it into a cake with a stevia sweetened Cream Cheese Frosting. See? It’s not so hard to be creative in the kitchen. Stir together flour, sucanat, baking soda, baking powder, salt, and cinnamon. Add eggs, pumpkin, and melted coconut oil. Spread batter into a 9×13 inch baking pan. Bake in a 350° oven for 25-35 minutes or until a toothpick inserted in the middle comes out clean. Allow cake to cool before frosting. Whip ingredients together until smooth. Spread over cooled Pumpkin Cake. Store in the refrigerator. As you can imagine, I will be adding some pureed spinach to this cake next time I make it. Why not, right? 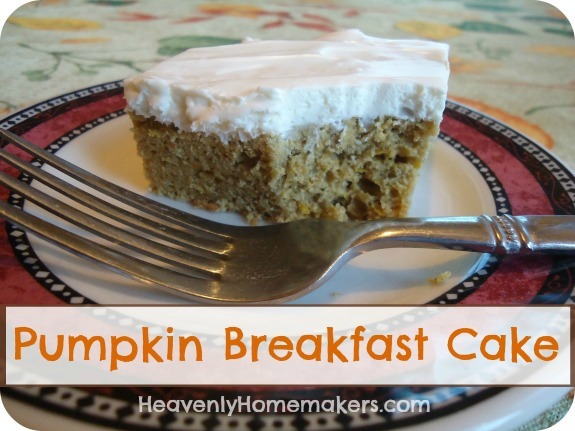 Here’s another Breakfast Cake recipe our family loves. Now tell me: What will your family say when you tell them you’re having cake for breakfast?! I love seeing the words “cake” and “breakfast” in the same sentence! When I was little and visited my grandparents in the Faroe Islands we had super dense rye bread (you could probably smack someone on the head with that bread) and sharp cheese and then we were allowed a slice of amazing French bread with chocolate on top. We love having cake and milk for breakfast. Our favorite is to put fruit such as blueberries in the cake pan, then pour a plain cake batter over top. Yum-m-m! Easy goodness,easy healthy,easy delicious! I have been in a kick of making Greek Yogurt cream cheese. I use it in many recipes. I used it this morning for the cake frosting recipe. I did not have any whipping cream, so I just mixed some vanilla and powdered sugar into my Greek cream cheese and it made a delicious topping. Everyone liked it. By the way…..where does one buy sucanat powdered sugar? I looked for it on Azure Standard, but did not see it. Thank you Laura for all the great recipes. I have been following you for years, I have taken a break, but now am on a Heavenly Homemakers kick again. I printed a lot of your lunch ahead recipes to organize myself to freeze lunches for my husband. There is nothing easier for packing a lunch than reaching into your freezer. FYI, before I read your post, I baked itty bitty pumpkins I got on sale 6 for $1 without poking them. They cam out fine. I don’t think sucanat powdered sugar is a product on the market yet. I think for now, we just have to make it ourselves by blending sucanat in the blender. If making your own doesn’t work for you, there’s always organic powdered sugar. Last I checked, Azure offers it, but it was out of stock. Thank you, I do have Azure powdered sugar. I also made this recipe again like Laura did with Stevia, real cream cheese and whipping cream, it was good too! Yeah, it is good. My family enjoyed it too. One of my babies thought it tasted like carrot cake. I’ve made this cake twice now and, although it is delicious, it is just a little bit dry. I’m not sure if I’m the only one encountering this problem, and I am a bit surprised that it doesn’t require any kind of liquid. Just wondering if anyone has any tips or ideas as to how I can fix this. Thanks! “Cake” and “breakfast” in the same sentence is my kind of sentence and breakfast! Thanks for this recipe. I’m pinning it to my pumpkin board. Thanks, Laura! I will definitely try that. It really is a delicious cake. And for those of you who don’t have stevia, or don’t like it, (I’m not a huge fan of it), honey works extremely well in the frosting. Although, I guess that would defeat the purpose of a lower sugar cake. LOL Still healthy, though! I just bought the baking blend stevia, have you ever used it? I don’t know why I’ve been spectacle to use the liquid stevia…or any other stevia for that matter. What do you suggest?